To Mould Character and Careers. Surana College, (est. 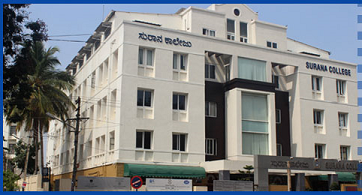 1995) under GDA Foundation Trust is affiliated to Bangalore University (u/s 53(5), (& under Karnataka State Universities Act 2000) and is also included under section 2(f) of the UGC (University Grants Commission) Act 1956. The institution has been catering to all sections of society on need-based quality education. Surana College, which offers courses in Arts, Science, Commerce and management streams, has clarity on students’ future, both in their career and life. The institution has many case studies of inducting average students only to raise them to achieve distinction or ranks. The emphasis is on academic focus adding to train for holistic development of students. Constantly identifying value-additions to the university stipulated curriculum, the college designs balanced inputs of curricular and co-curricular components into its practice. The institution prepares students into self-reliant, independent thinking, globally relevant, skilled and socially useful citizens of the nation embedded with values to contribute in their own mite to the society. Students at the campus will have the due freedom coupled with responsibility and discipline. No culture shocks in the campus. The college encourages research bent of mind to challenge the life and knowledge concepts by out-of-box and lateral thinking. There is also encouragement to entrepreneurial activities. No donation at the Surana’s; with affordable fee against quality, the curriculum is embedded with pro-community practices. Offering co-education has been an advantage with the institution. Student involvement is in the key functioning at the college even in extension activities, community services and sustenance of academic environment. Parental and public acceptance have been of immense support for the college functioning. Scholars, veterans, experts and prominent citizens as visitors encourage with suggestions and motivation. The corporate sector, service industry and socio-cultural institutions look up to have the students from the college in their organizations. The staff are aware of the importance of identifying and training different levels of leadership with a 3600 perspective. Healthy academic relationship between faculty and students has enhanced and secured the learning outcomes. Effort to maintain and preserve the joy of learning has augured well for the institution. Immense support from the Management and good interdepartmental co-ordination makes the institution stand proud.